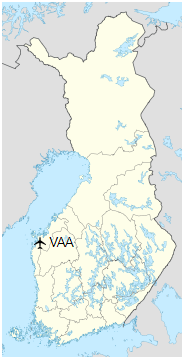 Vaasa Airport (Finnish: Vaasan lentoasema, Swedish: Vasa flygplats) (IATA: VAA, ICAO: EFVA) is located in Vaasa, Finland, about 9 kilometres (5.6 mi) south-east of Vaasa city centre. It is the 6th biggest airport in Finland in terms of passengers. In 2016, 288,520 passengers traveled via the airport. In 2005,, again in 2008, Vaasa Airport was chosen as the Airport of the Year in Finland, and was honored once again in 2016 . Regular users of Vaasa airport are Finnair and Scandinavian Airlines. The airport is also served by several charters with destinations to Bulgaria, Canary Islands, Greece, Spain, Turkey and Thailand. 218,742 155,399 374,141 +10.5% .